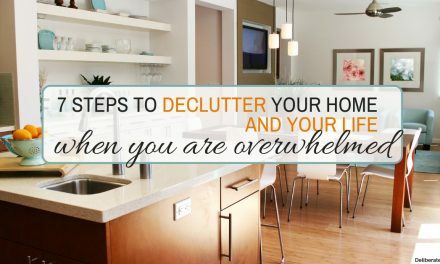 Decluttering your whole house is no small task and chances are you’re going to feel a bit (a LOT) overwhelmed when you think about decluttering your house. 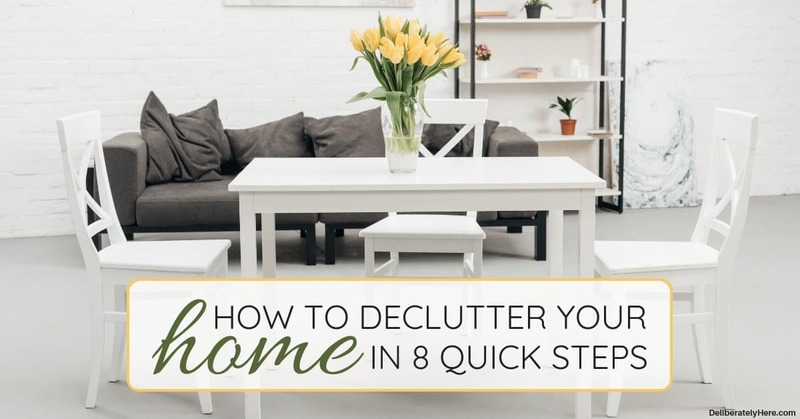 Whether you just have a bit of clutter collecting in your home or every nook and cranny in your house is filled with stuff, there are certain steps you can take that will show you how to declutter your home as quickly and effectively as possible. I used to be the type of person that liked to hang on to stuff just in case. I liked to hold on to duplicates of items just in case we ever needed them, I liked to hold on to old, ratty clothes just in case I ever found time to mend them, and I liked to hold on to broken decorations and appliances just in case we could fix them ourselves. As you can imagine, my husband and I had way too much useless stuff. Stuff that we were (I was) storing away just in case. Over time I went from someone who liked to keep every little thing, whether it worked or not, to learning how to let go of stuff and live with less. I was holding on to all our stuff with the mindset of what if our something broke and we needed a backup. Even though the backup may also have been broken. There will always be a “what if” situation. If we kept backups for those “what if” or “just in case” moments for every little thing in our house, we would truly be living in a heap of clutter, so the line has to be drawn somewhere. What if the kettle breaks and we don’t have a spare and can’t afford to buy another? Well, maybe then we would just have to boil water in a pot on the stove for a while until we can afford to buy another kettle. There are endless what if situations and it’s time to stop letting that be an excuse to collect clutter. While you might be in the same boat that I was in, keeping spares around just in case, you might be in another situation and might just like to collect things for no reason other than that you like to collect things. Or, maybe you can’t say no to hand-me-downs and find yourself feeling guilty when you go to get rid of them, even if they are the wrong size or something you would never wear (that was me, too). There are many different reasons why someone may have a house full of clutter. 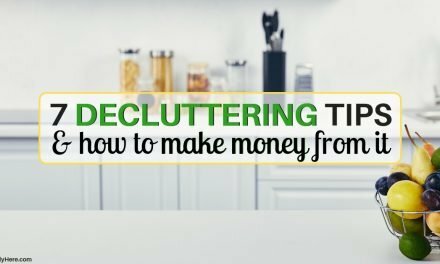 It’s time to realize your clutter problem and start taking the proper steps towards learning how to declutter your home. Don’t be someone who denies that they have any clutter in your house (unless you truly live in a clutter-free home, in which case you might prefer this post on habits of highly organized people, instead). 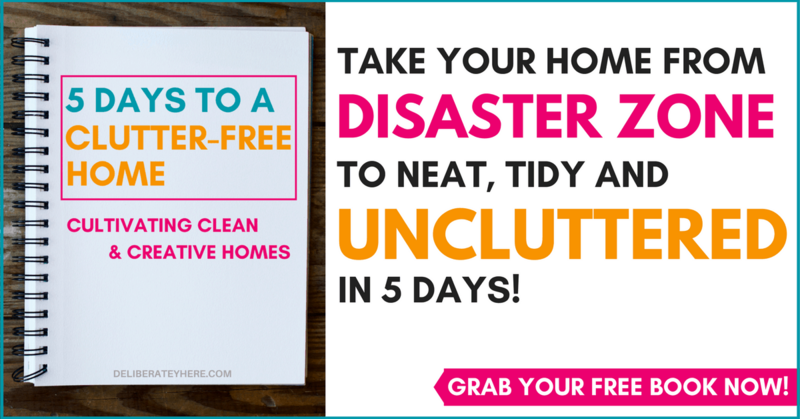 If you’re ready to start decluttering your house – let’s get right to it! READY TO START LIVING A SIMPLER LIFE? You are the only one who can come to this realization for yourself – it doesn’t matter how many times someone keeps telling you that your home is cluttered, if you don’t believe it yourself, you’re going to have an extremely hard time getting rid of your stuff. 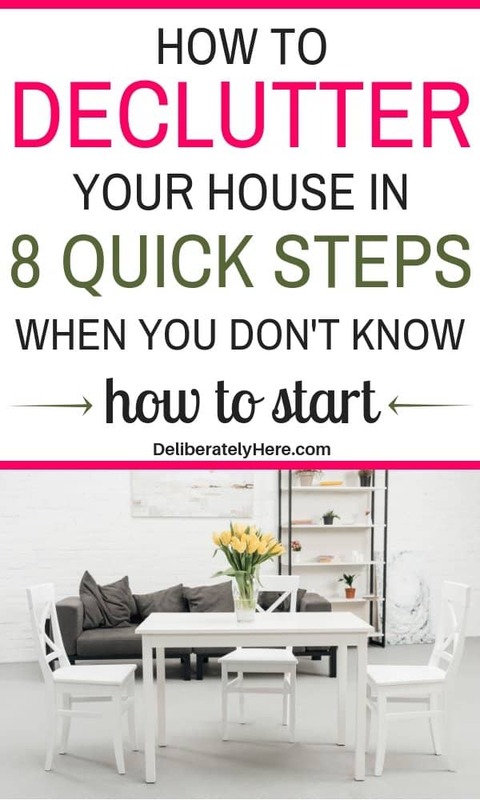 If you’ve already come to this realization, you can move on to the next step in how to declutter your home, but if you haven’t yet come to this realization, you will need to do that first. If you’re struggling with this, ask yourself a few questions. How much of the stuff in your home do you use on a regular basis? Which items do you have that serve the same purpose as another? What objects in your home haven’t been used for several months? Are there any items you may come across that you completely forgot you had? Do you really need these? If you got rid of (name item here), would you be able to make do without it? After you’ve asked yourself these questions and assessed how much stuff you actually have that you don’t use that often or need, you may be ready to start decluttering. Though I often recommend you declutter by going around your house room-to-room with three bins, one bin for stuff that will be donated, one bin for stuff that you will sell, and one bin for stuff that you will throw away, this method is a bit different. For this method you’re not going to worry right now about separating the items in the room into these different bins, all you’re going to do is go into a room, pull everything out of drawers and go through it all. When you’re going through your stuff, you’re going to put it into two piles. One pile is your keep pile, these are items and objects that you are going to keep, the other pile is anything that you are not keeping. It doesn’t matter if you’re going to be throwing an item away, selling it, or donating it, any item that you are not keeping you will put into this pile. By the time you’ve gone through the entire room, you should have ONLY two piles – a keep pile and a get-rid-of pile. If you have a third pile, possibly for “maybe” items, that’s not okay. If you do have a third or a fourth pile by the time you’re finished, go through the extra piles and place the items into the original “keep” or “get rid of” piles. Once you’ve sorted everything in the room into two piles, you can then put everything in your “keep” pile back into their places in the room, then you can sort the “get rid of pile” into these three bins. One for selling, one for donating, and one for throwing away. Everyone has a vision of how they would love for their house to look. It may be close to how your house already looks, or it may be the complete opposite. 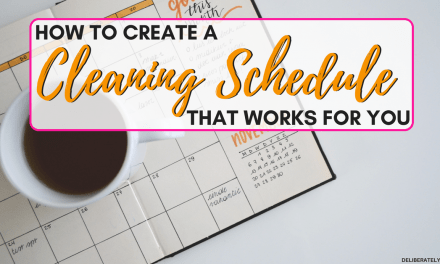 Either way, sit down and make some goals that you want to achieve while you’re decluttering. Maybe you want to get rid of half of the things you own, or maybe you want to have your house completely decluttered in one weekend. Maybe you want to take a free decluttering challenge to push yourself past your limits, or maybe you just want to have a relaxing time and enjoy decluttering. Whatever it is you want to do, write down your goals so you know what it is that you’re working towards. Pacing yourself is extremely important, especially when you’re learning how to declutter your home. If you haven’t done much for decluttering before it is easy to get yourself all excited and raring to go and end up burning yourself out. If you declutter for an entire day with no breaks, there’s a good chance you’re going to end up burning out and you won’t finish the goal you set out to complete. Taking your time and pacing yourself is important. Even if you want to completely declutter your house in just a couple of days, you may feel pinched for time, but you should still take frequent, short breaks to refresh yourself. When we work too hard for too long we often get worn out and start working with only half the effort, rather than putting all our effort in. We may skip over certain items and convince ourselves that we don’t need to declutter a certain room or area of our house because it’s already pretty clean. Stop this from happening by pacing yourself whether that means using a timer to remind yourself to take breaks, or just setting small goals for the day and stopping once you’ve achieved them. Don’t feel like you need to do it all in a short amount of time. Wouldn’t you rather do a better job the first time around than have to come back and pick up after yourself in a couple days because you realized you didn’t do the best job you could have? Often when people think of decluttering their house they think of knick-knacks and stuff like that, but forget about the importance of decluttering their closet. Decluttering your clothes and your shoes and only keeping an amount of clothing that you actually need, rather than having loads and loads of extra clothes, will help free your house of clutter. When I started decluttering our house, I would intentionally skip over the closets. I used to have way too many clothes – most of them being hand me downs. I would feel guilty when I thought about getting rid of the hand me downs I got. What if the people that gave them to me asked me how I was liking the clothes? What if they asked if I wore them often? What if, what if, what if. Even when I tried to sort through my clothes to get rid of them, I would end up finding maybe five pieces out of my entire closet to get rid of, and hoarding the rest. A lot of the clothes in my closet didn’t even fit me properly – but I would still hang on to them. I did eventually decide that enough was enough, and I really didn’t need that many clothes. So when I got serious about decluttering my clothes, I would ask my husband or invite a friend over to help me go through my clothes and keep me accountable. I would ask them to make sure I got rid of a certain amount of clothing, and only kept the stuff that fit me nicely and I wore often. Having someone else there while I decluttered my closet was a game-changer. They kept me accountable and helped me get rid of stuff. If you struggle with getting rid of stuff in your house (even stuff other than clothes), simply ask your spouse or a close friend to come over and help you. As I mentioned earlier with sorting your belongings into two piles, when you’ve successfully finished decluttering a room, put all the items you are keeping into their proper places and organize them nicely. If you don’t happen to have room for everything, consider going through that pile once more and finding a couple more things that you could get rid of. If you don’t have a place for something, it doesn’t belong in your home. If it’s something you absolutely need in your home, consider getting rid of something else to create space for this item. Paper clutter is a whole battle in itself when it comes to decluttering. With everything from various pieces of mail throughout your house to bills being piled up on the desk, paper clutter can get extremely overwhelming. If you have piles of paper all throughout your house, tackle them immediately. Sort all the paper clutter you have into several different piles. If you have a filing cabinet and your own unique sorting system, use that system. If you don’t have any system at all, place the various pieces of mail in different piles. As you go through your mail, make a separate pile for things that you don’t need and that can be tossed. It’s important to always keep your bills and receipts so you can look back at them in the future if you need to, or return stuff if you need to. Be sure to sort the mail as soon as it comes into your house each and every day to eliminate it from becoming a large pile. Once you’ve finished decluttering your house, quickly go through your house with a vacuum and dusting rag. These rags work absolute wonders. Give all the floors a quick vacuum and all ledges a quick dusting, this way your house won’t only be clear of clutter, it will also be clean. You may find a lot of dust bunnies after you get rid of some of your clutter. The more stuff you have in your house, the more places for dust to hide and collect. This cleaning doesn’t have to be anything too thorough or time-consuming, simply take a few minutes to do it quickly so you aren’t dragging any dust bunnies around that may have been hiding behind items that you just got rid of. 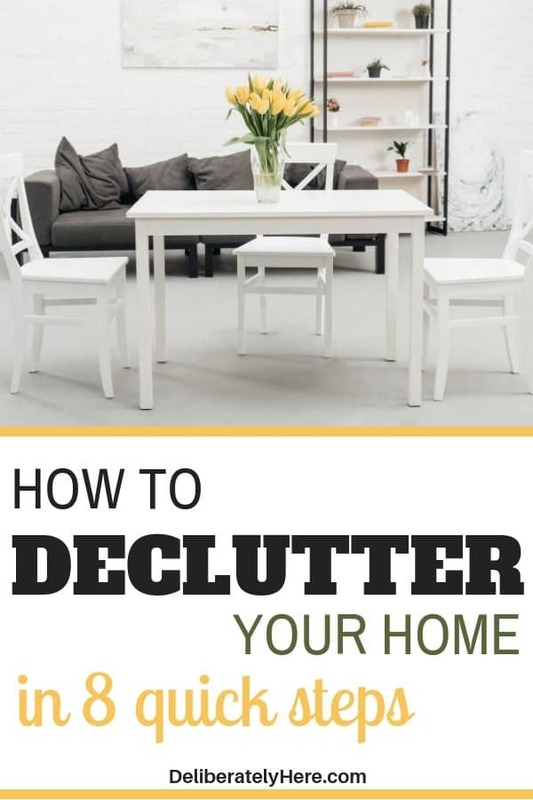 Learning how to declutter your home doesn’t have to be hard. Use these simple steps to get you started today, and remember to pace yourself. Don’t push yourself to the point of exhaustion or you just wouldn’t be doing the best job you could be. Are you a seasoned declutterer looking for new tips or a complete newbie to all things decluttering? Either way – I’m glad you’re making the decision to get rid of clutter and take back your life. Do you have some decluttering tips hiding up your sleeve? I’d love to hear from you!